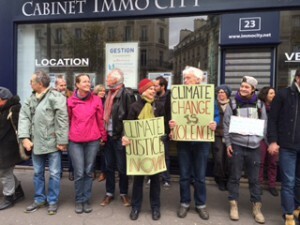 Photo shows CAGJ members Bobby and Michael Righi participating in Nov 29, 2015 protest in Paris. World leaders are gathering in a large city in the global north this week and next to ostensibly solve global problems that affect all of us. At the table are many rich, privileged, and mostly white men from powerful positions in government and industry. The kick-off was on November 30. This could describe either the shutdown of the 1999 WTO ministerial in Seattle, or the COP21 climate conference taking place now in Paris. Not every movement harkens back to that week in 1999 when people power defeated corporate power, but there are enough common threads in the causes, solutions, and mobilizations against the WTO and the COP21 for a fair comparison. The stakes are just as high today as they were for the Seattle ministerial. The WTO protests were against the pro-corporate, free trade agenda pushed by the WTO and other international financial institutions. The COP21 has a different focus, but the popular mobilization, demands, stakes, and players in the negotiations all echo those aspects of the WTO ministerial. We are still fighting corporations’ power and influence in global institutions. And, given the stakes, the need for real solutions for climate justice, and the need to counteract fossil fuel and other polluting interests, grassroots people’s movements who will push for real solutions outside the official talks are just as important as they were in 1999. The fingerprints of corporate interests are all over many of the world’s politicians, who are unwilling to commit to just climate policies, instead promoting carbon markets that would permit the fossil fuel industry to continue warming the planet, and create further profit-making opportunities for the 1%. World leaders’ lack of political will to commit to truly progressive and lifesaving carbon reduction and temperature goals is causing a climate catastrophe. False solutions like carbon markets put off the true solutions we should have already enacted. In their November 30 press release, the It Takes Roots Delegation call carbon markets and offsets “the trojan horse that the fossil fuel industry is pushing through the Paris Climate Agreement”. While protests have been banned in Paris in the wake of the recent terrorist attacks, thousands are taking to the streets in defiance of what Naomi Klein has called a “shock doctrine” response by the French authorities. We know from experience that the role of grassroots movements is critical, both in changing the momentum of global negotiations, and ultimately in leading the solutions to the crises facing our planet and its many peoples. The climate justice movement evolved out of many movements preceding it, including the global justice movement that shut down the WTO. CAGJ was born of that great week of protest, and we proudly carry on the legacy of creative and strategic grassroots action for justice. Through our commitments to promote food sovereignty and agroecology, we join the climate justice movements, and honor the local leadership of the grassroots people of color-led organizations whose historic Summit we recently participated in (read more about the Communities of Color for Climate Justice at FrontandCentered facebook page). We must work to ensure that commitments, decisions, and solutions coming out of the COP21 encompass justice and a sustainable future for all people.